A seventh game became necessary between Detroit and Pittsburgh in the 1909 World Series when the Tigers defeated the Pirates, 5-4, in Game Six on October 14 at Bennett Park. From the time that Babe Adams became ill following Wednesday afternoon’s game in Pittsburgh, team trainer Ed LaForce worked on the rookie pitcher, who was stiff and sore for days. When Saturday arrived for Game Seven at the Tigers’ ballpark, Adams was in pretty good shape due to LaForce’s therapeutic measures. 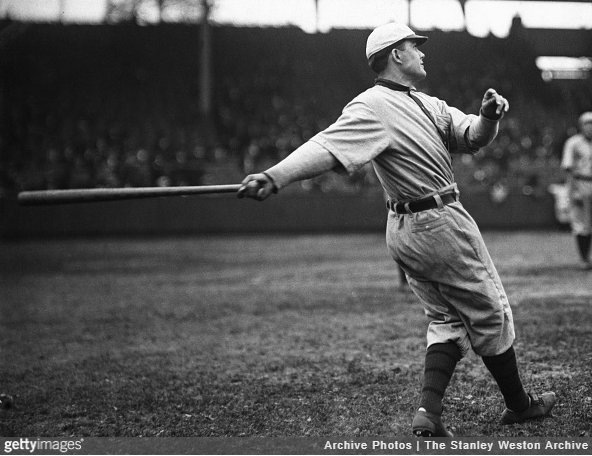 The Pirates trainer also received critical assistance from Fred Clarke and star shortstop Honus Wagner, guaranteeing that Babe was ready to pitch the pivotal contest. The night before the deciding game on October 16, Clarke and Wagner took Babe to a bathhouse in Detroit where he received a Turkish bath, which was limited in nature so it didn’t weaken the hurler. Adams was given a five-minute sweat in the establishment’s hot room in order to make his muscles flexible. Following this procedure, Babe received an alcohol rubdown before he was tucked into bed at 8:30 p.m. in his warm, cozy hotel room. These remedies proved critical for Adams and the Pirates since Detroit’s weather on Saturday afternoon was cold and raw. As it turned out, the lousy weather ended up hampering Tigers starting pitcher Bill Donovan, who couldn’t get loose on this chilly afternoon. Pittsburgh touched up Donovan for two runs in the second inning before fellow hurler George Mullin pinch hit for him in the third frame. In his three innings of work, Donovan walked six Pirates batters. Mullin took up the twirling task for Detroit after he batted and was further drubbed by Pittsburgh, who pushed across two runs in the fourth inning, three tallies in the sixth frame, and a solo marker in the eighth. Babe Adams was untouchable once again as he threw a complete game, tossed a shutout, and allowed six hits, as the Pittsburgh Pirates secured an 8-0 victory, and claimed baseball’s world championship. Babe Adams joined an elite group of pitchers that included teammate Charles “Deacon” Phillippe, the Boston Americans’ Bill Dinneen, and Christy Mathewson of the New York Giants, who had won three games in one World Series. Besides securing three victories against Detroit, Adams posted a miniscule 1.33 ERA. Six years after the Pirates claimed their first World Series title, Fred Clarke explained his rationale behind passing over veteran hurlers and choosing a rookie to pitch Game One against the Tigers. It was a grand Saturday night in Smoketown as spirited revelers invaded downtown Pittsburgh to celebrate the Pirates’ World Series victory. Throughout the afternoon, streets adjacent to newspaper offices all over Pittsburgh had been packed with eager fans waiting to hear Game Seven’s results. Once the information surrounding Pittsburgh’s definitive triumph became known, a wild, joyous celebration quickly ensued. Street car traffic was abandoned on the major downtown thoroughfares, while the noise and crowds in the business districts of Pittsburgh’s suburbs rivaled the commotion that was transpiring on the city’s main streets. Baseball fans marched through Pittsburgh behind brass bands, cheering wildly and waving pennants, while carrying photos of World Series hero Babe Adams that had been displayed in stores across the city. Pittsburgh Mayor William A. Magee also issued a proclamation declaring a public parade and celebration would be held on Monday, October 18, to honor the Pittsburgh Pirates. As the people of Pittsburgh celebrated their beloved baseball team’s World Series victory, the Pirates’ entourage quietly traveled home by train on Saturday night. Although National League president John Heydler, manager Fred Clarke, veteran pitcher Deacon Phillippe, and each individual’s spouse retired to a separate car so the players could commemorate their achievement by partying, no celebration was forthcoming. Pittsburgh’s players decided not to break training on Saturday night by drinking or carousing. This particular Pullman car was the serenest on the train as each player climbed into their sleeper berth at an appropriate hour without incident. On this trip home from Detroit, manager John P. Harris of Pittsburgh’s Grand Opera House started a collection for Babe Adams. The first contribution came from Adams’ teammates, who voted unanimously to pledge $500 to the youngster responsible for leading them to victory against the Tigers. In less than 30 minutes, the fund eclipsed $1,000, as numerous Pittsburgh dignitaries who had been traveling with the club gladly made a contribution. The train carrying baseball’s world champions arrived in Pittsburgh at 8:00 o’clock on the morning of October 17. The locomotive’s arrival time was kept secret from local denizens since the Pirates preferred a quiet return home rather than a loud, boisterous demonstration. While the Pirates’ players were afforded privacy upon arriving in Pittsburgh, Babe Adams quickly realized that his newfound fame came at a price. It certainly wasn’t a quiet Sunday for Adams and his neighbors who lived on Mawhinney Street in Oakland, as a crowd started gathering outside his home at 10:00 a.m. By noon, the massive throng had grown to nearly 1,000 people. Included in the crowd were 463 women who were solely there for the purpose of kissing World Series hero Babe Adams. At least 500 male fans were also stationed outside his home, hoping these females could accomplish their goal. Babe remained sequestered in his domicile until he couldn’t stand being cooped up any longer. Shortly after noon, he slipped out the back door and found refuge in a nearby private hotel. Adams’ peace was short lived as the crowd quickly caught wind of the subterfuge. By 2:00 p.m., 1,000 devoted Pirates fans were standing on the street in front of the hotel where Babe had fled. The crowd cheered and called for Adams to present himself, but Pittsburgh’s pitcher failed to appear. Babe apologized to the hotel’s other guests for all the commotion outside, before he explained that his wife Blanche would prefer that he not traverse about town to be kissed by other women. This large crowd congested the Oakland street for four hours. The time for celebration finally arrived on the evening of Monday, October 18. As crowds of people started gathering outside, Pittsburgh Pirates’ players and club officials were given a banquet in their honor in the Fort Pitt Hotel’s Flemish Room. When this festive celebratory dinner ended, each member of the Pirates’ entourage was escorted to waiting automobiles that drove them along a parade route surrounded by screaming baseball fans. People cheered their approval and 12 brass bands played music as the parade wound through downtown Pittsburgh and Oakland, before reaching its final destination at Forbes Field. Around 20,000 people jammed Forbes Field in order to watch the World Champion Pittsburgh Pirates showered with due recognition for their phenomenal achievement. Each player received an introduction on a stage located in the center of the diamond, before being handed his World Series winner’s share check by Pennsylvania Congressman James Francis Burke. Babe Adams was afforded the loudest ovation from the crowd when he stepped on stage and received his check for $1,825, and an additional purse of $1,264, that had been collected on the train ride from Detroit to Pittsburgh. The energetic crowd yelled for Adams to make a speech. The young pitcher, who had shown the poise of a veteran against Detroit in the World Series, couldn’t collect his thoughts. Babe remained silent in the face of his admirers as tears began streaming from the youngster’s eyes and rolling down his cheeks. While Adams was unable to articulate his feelings on this occasion, an item connected to his great World Series performance spoke volumes in a downtown Pittsburgh store. When the Pirates claimed the National League pennant, manager Leo Lehman of the May, Stern & Co. furniture store, located at 914-916 Penn Avenue, suggested changing the location of the company’s quarterly October meetings from St. Louis to Pittsburgh. Throughout the World Series, Mr. Lehman procured boxes for each game at Forbes Field for himself and the establishment’s other 14 store managers. After the World Series concluded, the May, Stern & Co. store in Pittsburgh undertook a marketing technique befitting a champion. In their Penn Avenue show window, an artificial lifelike baseball player was positioned, adorned in the uniform worn by hero Babe Adams during the 1909 World Series. The legend of Babe Adams, which saw its birth in October 1909, still lives today, as a new generation of young Pirates hurlers start carving out their paths as major league players, hoping to someday perform on baseball’s grandest stage.